Mike Greene - mgreene@shawmedia.com Nicole Szeszel, Melissa Talaga, Haley Smith and Mike Sottile laugh at photos taken before the start of commencement ceremonies for Crystal Lake South Saturday, May 26, 2012 in Crystal Lake. 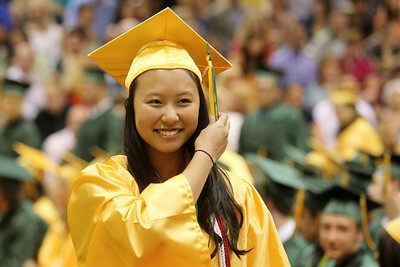 Mike Greene - mgreene@shawmedia.com Crystal Lake South Valedictorian Carol Feng switches the side of her tassle after receiving her diploma during commencement ceremonies for Crystal Lake South Saturday, May 26, 2012 in Crystal Lake. Feng graduated with a 4.70 GPA and will attend Northwestern University majoring in Pre-Med. Mike Greene - mgreene@shawmedia.com Michelle Babcock waits for commencement ceremonies for Crystal Lake South to begin Saturday, May 26, 2012 in Crystal Lake. Mike Greene - mgreene@shawmedia.com Elizabeth Starck gives a welcome address to classmates during commencement ceremonies for Crystal Lake South Saturday, May 26, 2012 in Crystal Lake. 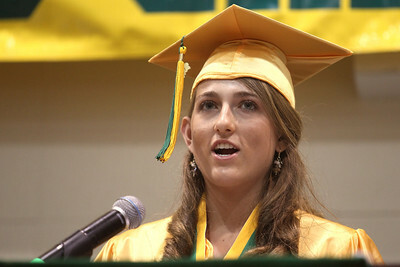 Mike Greene - mgreene@shawmedia.com Elizabeth Adams listens as members of the student council speak during commencement ceremonies for Crystal Lake South Saturday, May 26, 2012 in Crystal Lake. 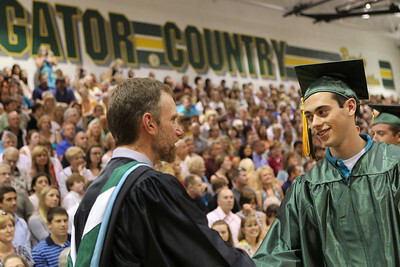 Mike Greene - mgreene@shawmedia.com Robert Baran shakes hands with a member of the faculty before receiving his diploma during commencement ceremonies for Crystal Lake South Saturday, May 26, 2012 in Crystal Lake. Mike Greene - mgreene@shawmedia.com Kayla Fitzgerald hugs Crystal Lake South principal Marsha Potthoff after receiving her diploma during commencement ceremonies for Crystal Lake South Saturday, May 26, 2012 in Crystal Lake. 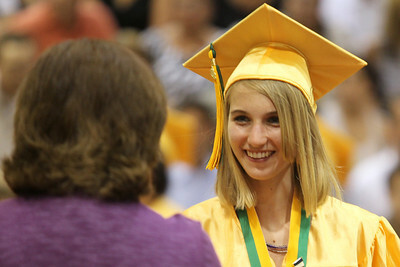 Mike Greene - mgreene@shawmedia.com Sara Lejsner receives her diploma during commencement ceremonies for Crystal Lake South Saturday, May 26, 2012 in Crystal Lake.